James Overkamp plays shortstop for the Ralston Rams, a travel-ball team out of suburban Omaha. He is 12 years old. He gets straight A's and is pretty sure if Dave Grohl ever decides to call it quits, he would be the perfect replacement in the Foo Fighters. Baseball is his real love, though. His dad played college ball. James practices almost every night with the Rams, and when there isn't a practice it's only because there is a game, 70 of them between spring and summer. On the eve of the season opener last year, James arrived home from practice with the promise of another great year saturating his mind. Then his mom asked him to sit down. She had something to tell him. Irving Falu was going to make it someday. He hadn't spent almost a decade riding buses across the Midwest only to see his dream peter out in Omaha. His mom hadn't raised him like that. She sent him off from Puerto Rico to the United States to crack the major leagues. He wasn't a great baseball player, by any means, but he did things right. And he was willing to play anywhere: second, short, third, outfield. Best of all, he loved the game. People could just sense that about Falu. He smiled a lot. He tossed balls to fans in the stands. They chanted his name in Omaha: "Fa-looooooooo." First in 2009, when he arrived as a 25-year-old, and for the next three years, as we waited for the call from the Kansas City Royals. Whenever it came, Falu knew who he'd tell first: the woman who meant more to him than anything. Doctors thought it was the gall bladder. Christine Overkamp had plenty of faith in modern medicine, having witnessed miracle after miracle as a labor-and-delivery nurse, so when they said removing the gall bladder would relieve her pain, she told them to cut it out. When that didn't help, they ran more tests. It was cancer in her colon, stage 3. She would need chemotherapy. Christine was 42. She had five children, and James, the second youngest, was always the sort to internalize his worry. So his father, Mike, had an idea: Take James to the Omaha Storm Chasers' opener where he could see his favorite player, Irving Falu. James loved Falu's versatility and his energy and his willingness to engage with fans. His friends could have their Derek Jeter and Albert Pujols and Josh Hamilton. He'd take Irving. Mike knew some people who knew some people, and they arranged for James to meet Falu. During the national anthem, the Storm Chasers starters walked to their positions with a local kid. James accompanied Falu and told him about his mom. "The first time I see that guy," Falu said, "I want to take care of him." Two days later, a couple of Storm Chasers employees showed up at James' practice out in the suburbs. They blew up a picture of James and Falu and framed it, though not before he inscribed a message for his new friend. Even now, Irving Falu isn't sure how he could survive without Silvia Gonzalez. She wasn't just mom. She was his chef, his chauffeur, his textbook, his psychologist, his motivator, his rock. He thinks about his mom what every son does about every great mom. "She's the best mom in the world," Falu said. "Both of my older brothers, Peter and Melvin, played. She would go with us because my dad didn't have time to take us to practice, so my mom would be the one. If I asked for something, even if she didn't have money she would figure out how to get it." Falu saw James' vulnerability. His mom's life depended on six months' worth of poison. Six months of uncertainty, of pain, of vomiting. Christine was all of the same things to James that Silvia was to Irving, the best mom in the world, and she wasn't going to be herself for what to any kid would seem like an eternity. And the scariest part was that neither James nor the doctors nor anyone knew if it would make things better. James couldn't help but think of his mom when he was at home, watching her suffer through chemo every few weeks and return to her job with tired eyes and a worn-down soul. This made him sad. He couldn't know the guilt Christine felt. This wasn't her fault, no, but she was supposed to be the one soothing him from his worries, not prompting them. So he escaped to the ballparks. At one, he could play shortstop and bat second and try to be like Irving Falu. And at the other he could be with Irving Falu. Baseball breeds relationships every day, everywhere, between fathers and sons, brothers and sisters, friends new and old, whether black, white, Latino or Asian. The game doesn't discriminate. It may have been the only thing that could connect a 12-year-old white kid from Nebraska with a 28-year-old Puerto Rican during a long summer for both. Falu never got the call. He hit .301 for the Storm Chasers, but he wasn't in the Royals' long-term plans. He was an org guy – good enough to keep around, won't embarrass the team, sets a strong example. Just not major league material. It was nice to see someone who thought he was. James went to Storm Chasers games as often as he could. He called for Falu before games and always was rewarded with a batting glove or a bat. If Falu was playing in the outfield, James would switch seats to get closer. They would talk in between innings. "How's baseball going?" Falu asked. "How are your grades?" Falu wondered. Good, James would answer, even if sometimes she wasn't. "James seems to hold a lot of stuff in," Christine said. "That kind of helped him have somebody to pay attention to him and get his mind off other things." For a few months, Falu's Facebook profile photo was of him and James. As much as Falu tried to give his friend hope, James gave it back. Somebody still believed he was going to make the major leagues, that all those years in Omaha wouldn't be for naught. 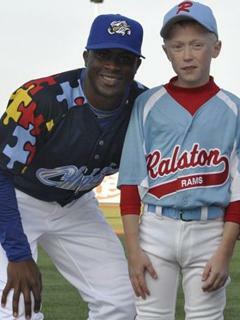 One day, James showed up at the stadium with something to give Falu: a Ralston Rams hat. If he wasn't getting a new hat in Kansas City, he deserved one from somewhere other than Omaha. "He try to make me feel good," Falu said. "And if he can go home and talk about my friend Irving, maybe he can forget for a minute his mom is sick. That's why I do it. I'm not special." Christine Overkamp went back to work full-time recently. Doctors say the cancer is gone. They didn't know at this time last year whether she would make it to see another Mother's Day. Now she just needs to show up every three months to ensure it doesn't come back. Her treatment lasted an entire baseball season, from the diagnosis on the eve of James' first game to her final dose on the day of his last fall-ball game. She admired him more than ever, her son with the strength to persevere knowing the person dearest to him could go anytime. So this spring, Christine bought James a present: two season tickets to every Storm Chasers game. James and Mike went together opening day. This time, Mike didn't need to pull any strings. Falu himself asked James if he'd stand next to him during the national anthem. The phone rang. It was 10:30 p.m. No good phone call comes after 10 p.m.
"I need to talk to you," the voice said. It was Mike Jirschele, the Storm Chasers' square-jawed, no-nonsense manager. Falu didn't know what to think. He looked at his roommate, infielder Tony Abreu, and said he was either going to the big leagues or getting released. Falu went to Jirschele's room. At least he was finally getting an answer. A decade in the minor leagues after surviving as a 21st-round pick. More than 4,000 plate appearances. Almost 1,000 games. Was he good enough? Was he not? All these years he had convinced himself he was while knowing in the back of his mind how many people believed he wasn't. He wanted so desperately for the Royals to see what James did. "You made it," Jirschele said. Falu started to cry. He shook Jirschele's hand, then hugged him. And hugged him again. And hugged him one more time. He cried some more. And then he composed himself, because he had something to do, something for which he had waited forever. "Mama," Falu said. "I'm going to the big leagues." The first thing Irving Falu did after the call was book Silvia Gonzalez a ticket to Kansas City. He would not let her miss this. Yuniesky Betancourt had hit the disabled list, and even though fans were clamoring for Johnny Giavotella to rejoin the team, the Royals called up Falu, to which most responded: Fal-who? He wasn't a prospect, wasn't a big deal – wasn't anything more than another anonymous surname toward the bottom of the box scores that had included Alex Gordon and Eric Hosmer and Mike Moustakas and Salvador Perez and all of the other talent the Royals had churned out in recent years. Falu was an org guy, and roster moves that involve org guys are often met with indifference or rolled eyes. Nobody in Kansas City knew anything about Irving Falu until his first start May 6, at shortstop, against the New York Yankees, with Silvia and his brother Peter in the stands at Kauffman Stadium. Peter was videotaping. Silvia was nervous. On the second pitch he saw, a Phil Hughes fastball that ran back over the plate, Falu took a spirited swing and let instinct take over. "I've waited for this all my life," he said. "It was a perfect pitch. I got it. I hit it. And I just ran." Falu didn't stop until he slid headfirst into third base. Silvia couldn't stop jumping. Peter failed in attempts to steady his camera. Royals fans acknowledged the exceptionality of the moment: a triple, the game's most exciting and rarest hit, to start his career. Exactly 200 miles away, in Ralston, cheers emanated from a boy whose friend just had done something special. "I was really proud of him for making it to the bigs," James said. "My dad told me he was going to, and he did." James misses Falu at Storm Chasers games, but he understands. Like James' dream that his mom would get healthy, Falu had one, too. He deserved to see it realized. It's not like James isn't going to see him again, either. Once Betancourt returns, Falu may end up back in Omaha. In the meantime, though, James wants to take a vacation: a healthy mom, a strong dad and all five children, hopping in the car and heading south to visit their favorite player, who finally made it.